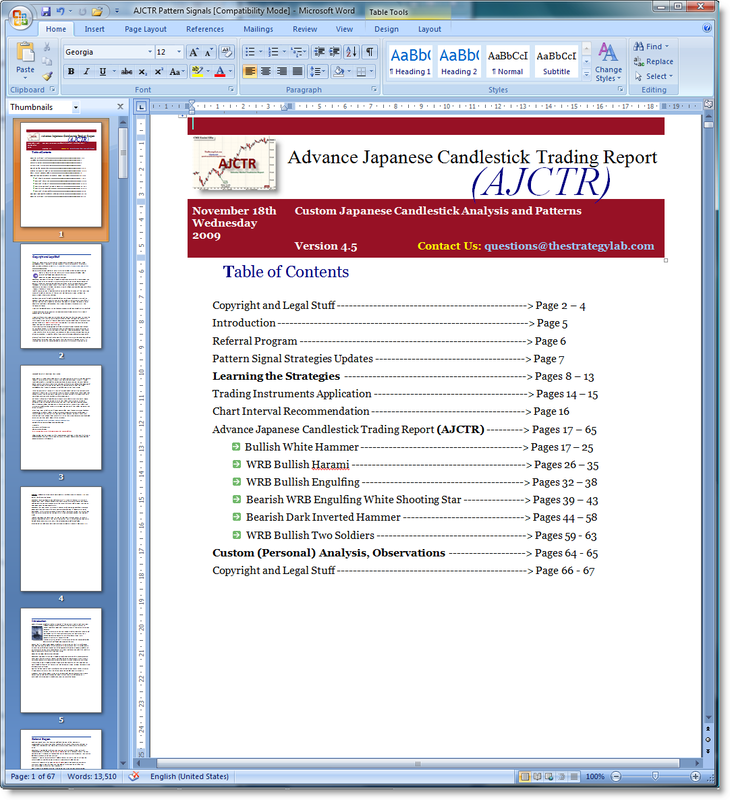 The Advance Japanese Candlestick Trading Report (AJCTR) is no longer available for purchase independently. 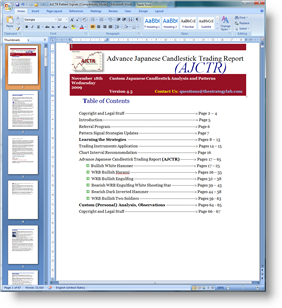 In contrast, the AJCTR is only available to traders that have purchased the Volatility Trading Report (VTR). 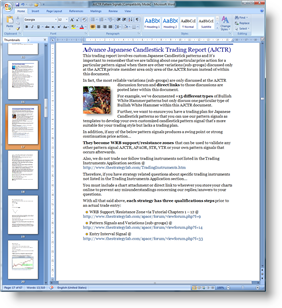 Yet, we will use this webpage as information only to help answer some of your questions about the Advance Japanese Candlestick Trading Report (AJCTR) that is now included as one of the resources with the purchase of the Volatility Trading Report (VTR). We give you more than just profitable trade methods. We post our own trades in a real-time chat room for you to learn and instill the concepts via your questions about any concept from the trade methods. 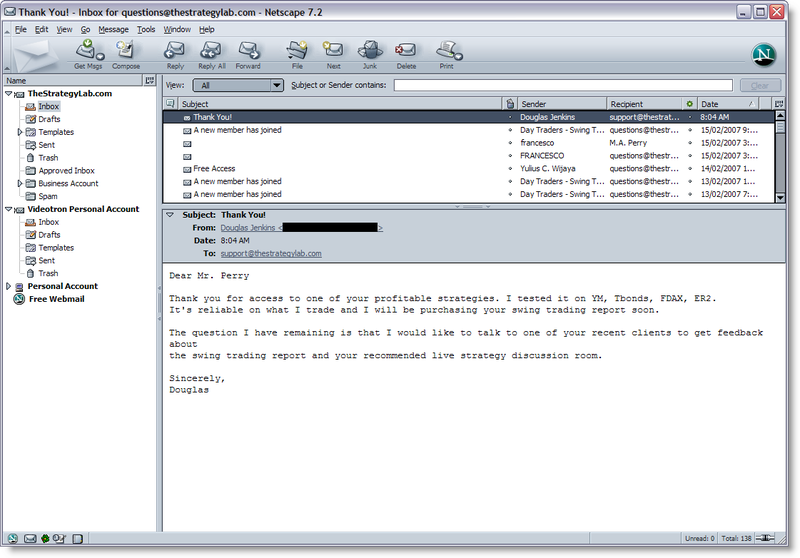 In addition, you can learn from the educational messages posted by other clients at the discussion forum. Also, we have a private member only forum, questions & answers sessions, method updates to exploit current market conditions, sharing of how we use our own methods within our trading plan that's not discussed in the method itself along with being available for real-time chat during trading to answer questions by clients. Also, clients can schedule real-time chats outside of trading hours. The Advance Japanese Candlestick Trading Report (AJCTR) contains rule-based objective price action only (no indicators) trade strategies from entry to exit provides you with the missing pieces of the puzzle to profitably trade Japanese Candlestick patterns regardless if you use our custom Japanese Candlestick pattern strategies, commonly known candlestick patterns or you want to design your own candlestick patterns via concepts from our profitable strategies. In addition, these strategies are exploiting changes in supply/demand as it occurs every trading day regardless if you're scalping, day trading, swing trading or position trading. Simply, this is an education course better than any current book, online article, trading course that involves advance trading strategies via custom Japanese Candlestick patterns merged with WRB Analysis to help you map out the price action prior to the trade, during the trade and after the trade...increasing the odds of the trade resulting in a profit. To see the complete list of trading instruments that's applicable for trading via these strategies...click here. 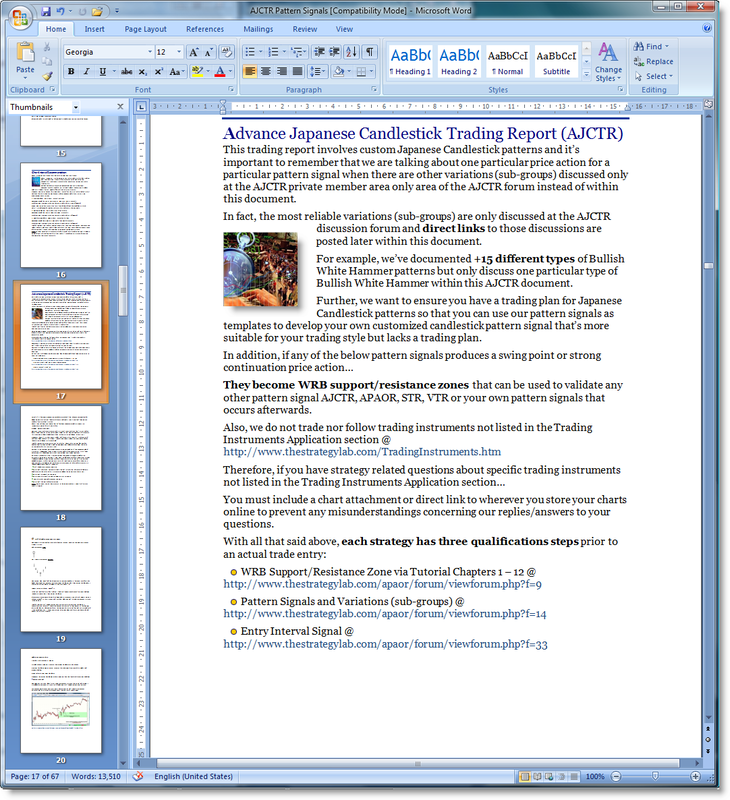 Also, if you have questions about the AJCTR prior to payment...please join our Questions & Answers forum at the below link especially if you're looking for inexpensive books or online articles prior to purchasing our Advance Japanese Candlestick Trading Report (AJCTR). AJCTR is a rule-based methodology that exploits trends, reversals, pullbacks, retracements, changes in volatility because it's merged with our WRB Analysis Tutorials. There are 3 AJCTR strategies to exploit bearish markets and 2 AJCTR strategies to exploit bullish markets via either as trend continuation signals or trend reversal signals with lots of easy to understand chart examples. These strategies exploit repetitive price action that isn't discussed anywhere else. You'll have unlimited free access to WRB Analysis Tutorials (Premium) Chapters 1, 2, 3 that provides the foundation for understanding the price action of your trading instruments prior to the appearance of any pattern signals from the AJCTR along with reducing trading problems whenever the market environment changes...a change that occurs many times per year. The AJCTR documents contains direct links to critical support documents, files, updates, Q&A message posts for current market conditions that's only stored at the private AJCTR discussion forum to ensure the methods remain reliable. You'll be able to use our trade management info from our custom patterns to enhance the performance of the most commonly known Japanese Candlestick patterns. These strategies are available as a Microsoft Word file. However, other formats such as PDF and Lotus Word Pro are available upon request only. The AJCTR is no longer available for purchase independently. In contrast, the AJCTR is only available to traders that have purchased the Volatility Trading Report (VTR). Copyright © 2002 - 2014. The Strategy Lab. All rights reserved.